Cook something festive yet inexpensive with a dish like Pork a la Pobre made from Del Monte Quick ‘n Easy Barbecue Marinade to satisfy your family’s supersized craving! 1. 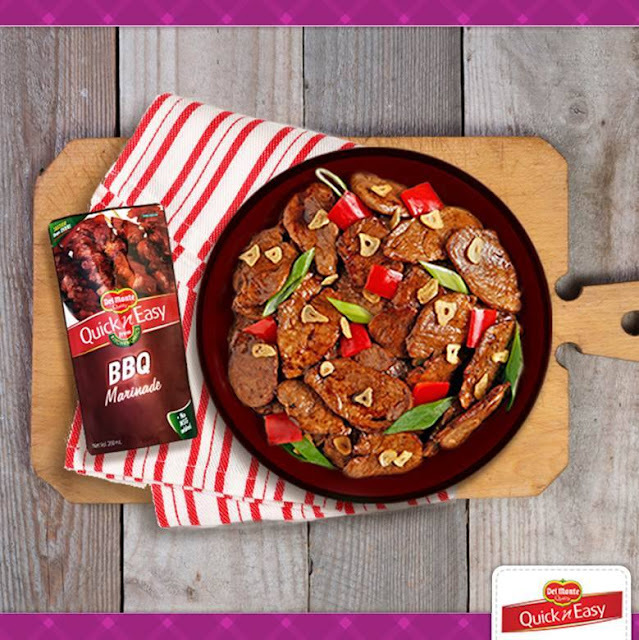 Pour Del Monte Quick and Easy BBQ over pork in a mixing bowl and mix well. Cover with a cling wrap and marinate for at least 30 minutes in the refrigerator. 2. Fry garlic in oil, then drain and set aside. In the same oil, fry marinated pork slices until just cooked then set aside on a plate. 3. Saute bell peppers and leeks briefly in the same pan. 4. Top pork slices with fried garlic, sautéed bell pepper and leeks. Wow, amazing recipe! Its a healthy one. This one is an excellent one.Thanks for sharing.looks good.Thanks for the tip. It was very useful.You made it and they actually turned out well.Happy to read your post and appreciating you for making this better and yummy foods.Thanks a lot.You will get academic integrity, quality and punctuality from sites available now. Hence, each of the paper done at custom essay writing service has a touch of professionalism.So try to write better and make your essay better at any level.Its the better way for you to make your essay with good contents.